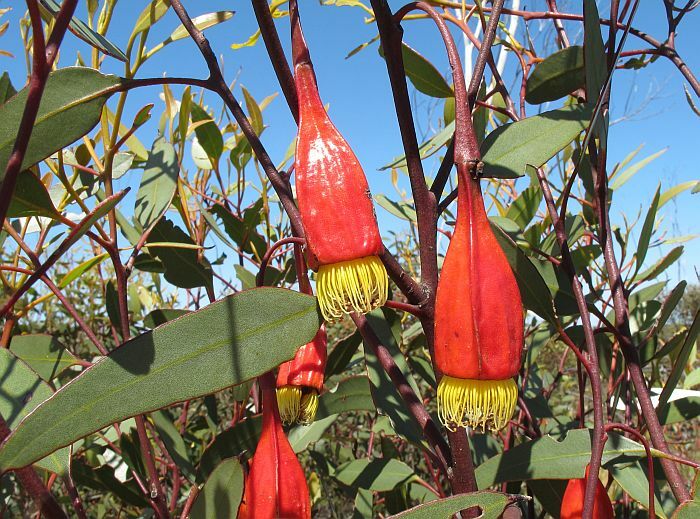 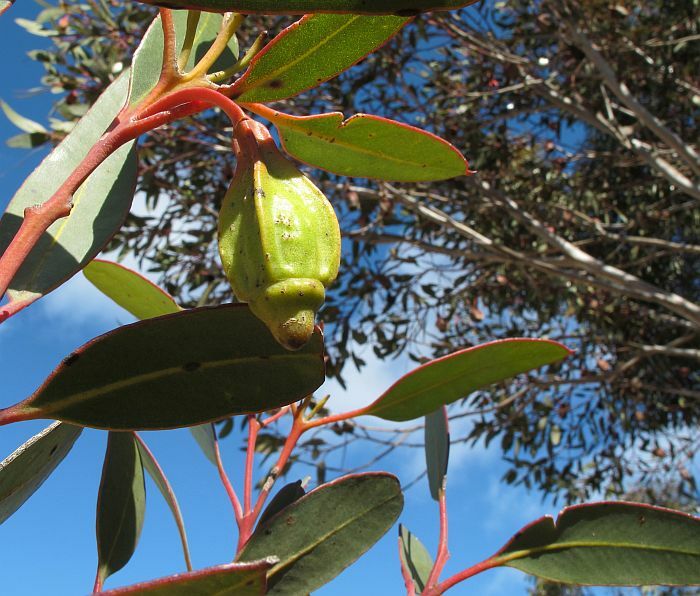 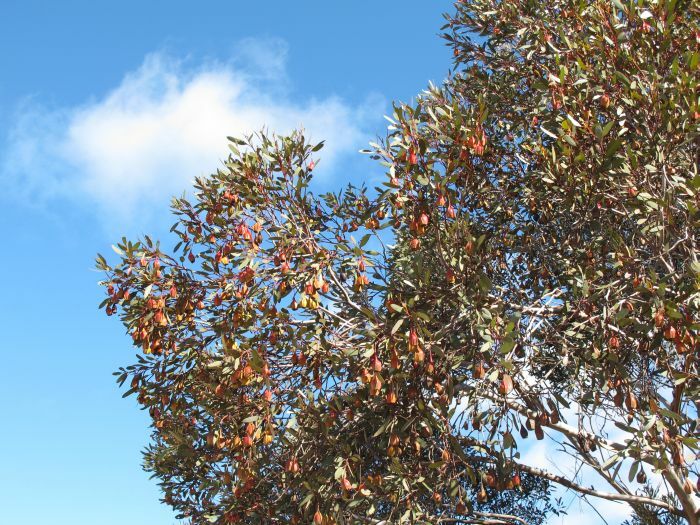 The Fuchsia Gum, also known as the Fuchsia Mallee, is a popular nursery species and well known to many gardeners, however few realise it only naturally occurs in mallee country to the NW and NE of Esperance, with the Peak Charles region being its most northerly limit. 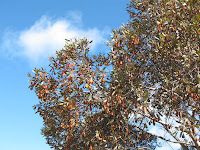 Eucalyptus forrestiana until recently had three subspecies, which have been reclassified into separate species. 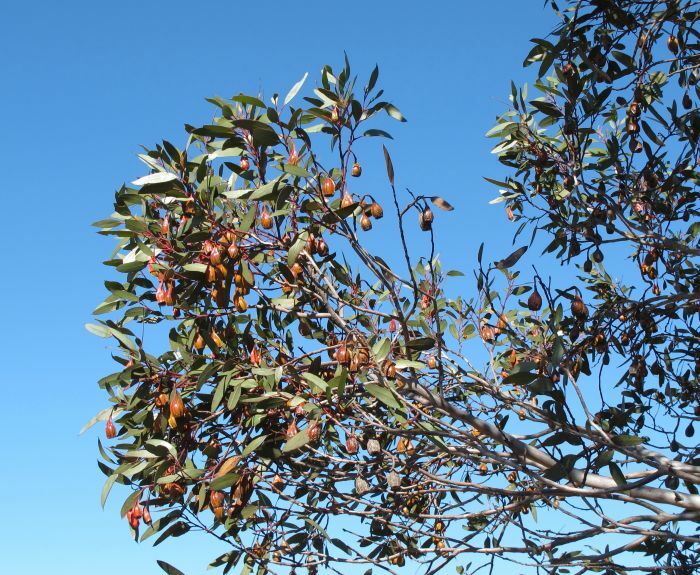 These are now known as E. dolichorrhyncha, which has a much longer operculum than E. forrestiana and E. stoatei that has additional ribs around the fruit. The latter has been documented here (see lower right-hand column). 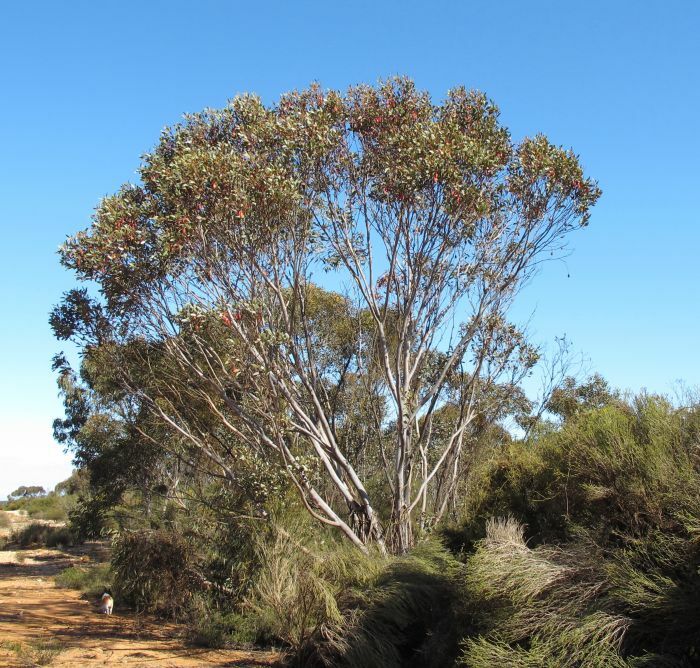 Eucalyptus forrestiana is quite variable in height, from 2-8 metres (6’- 26’) in height, the shorter ones often mallee like (multiple stems) growing in shallow sandy soils over limestone, whilst the larger tree like ones (single trunk) favour low-lying areas in deeper heavier loams. 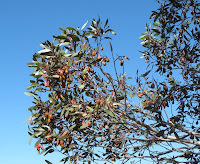 They are also found in sandy/clay soils over broken granite. 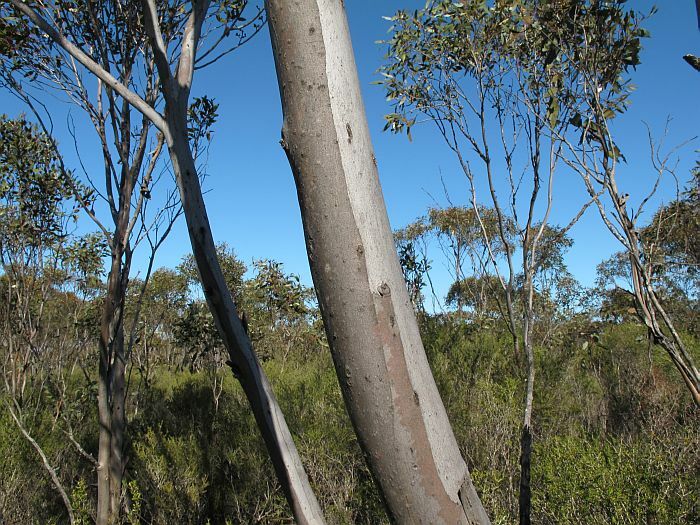 The trunks are silvery grey with pinkish highlights and uncluttered with old dead stems. 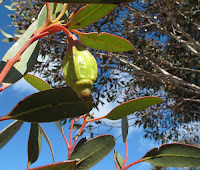 Initially buds are greenish, changing to yellow/red and commonly progressing to bright glossy red. The fruits remain red for several months, but gradually change to brown, purple and grey. 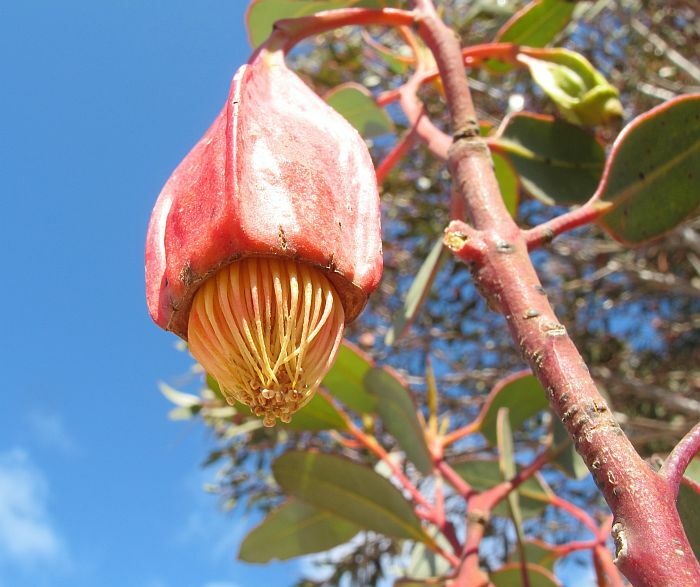 The actual flowers are yellow and relatively small, playing a secondary ornamental role to the hanging red capsules, which are strongly four ribbed and grow to around 5 cm (2”) long and 3 cm (over 1”) wide. 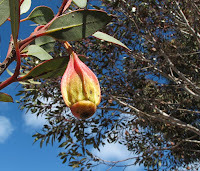 The stalk is another 5 cm in length, so are very noticeable. 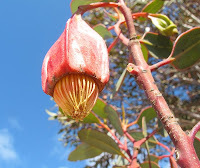 With such spectacular fruits, flowering times are less important regarding visual appeal, but they can bloom throughout summer and autumn, although the main period may vary depending on environmental and weather conditions. Where Eucalyptus forrestiana occur, they are often very common and demand your attention as you pass through.